At Buffalo Envy, we truly feel that our experienced and close-knit staff sets our program apart! We have the most experienced coaches in the area, with strong backgrounds in cheerleading, gymnastics, dance, choreography, and coaching the sport of all star cheerleading! a STRONG passion for the sport. Coach Vicki was a gymnast for 13 years, and an all star cheerleader for 5 years. Vicki attended college at the University of Louisville, where she was on the Louisville All-Girl Cheerleading team. She returned to Buffalo and has her Doctorate of Physical Therapy from D’Youville College, and has been coaching at Envy since the doors opened in 2008. Vicki is First Aid & CPR Certified, and USASF Certified Levels 1-5. Feel free to contact Vicki if you are interested in private tumbling lessons. Coach Kara began cheerleading and gymnastics at a young age. She was a competitive gymnast for 12 years, and competed at Level 9. She has also cheered for 13 years, 8 of them being in all stars. She was a Buffalo Envy Senior 5 cheerleader for 2 years, on the Envy Cheerleading Worlds team in 2009 & 2010, and is an 8-time national champion. Kara’s dedication, love for the sport, and ability to be a great role model lead her directly into coaching at Envy. Kara has her B.S. in Psychology. 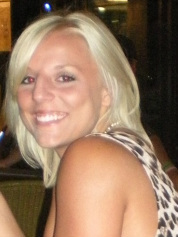 Coach Katie is one of Buffalo Envy’s Co-Owners, and loves the cheerleading world! Katie is a former Head Instructor with the National Cheerleader Association (2000-2008). She has been coaching cheerleading for 18 years, and is an experienced choreographer, as well as a private instructor in stunting and tumbling. Katie is First Aid/CPR Certified, as well as USASF Certified Levels 1-5. Outside of cheerleading, Katie is the Head Administrative Assistant at Ironworkers Local No. 6, and a full-time mommy to Zak, and Tanner & Callan the most fulfilling and rewarding thing in Katie’s life. “I am very committed and passionate about everything that I do in my life. I feel anything done without passion isn't done to someone’s greatest potential. I know the time, commitment and challenge it takes to be the best possible coach that I can be and I will do whatever it takes to make my team and program as successful as possible. I hope in return our athletes and families share the same commitment and passion it takes to be successful. Being a coach is an incredible feeling, and I look forward to this upcoming season. I know what it takes to be the best coach that I can be and look forward to this year! Coach Brandie was a competitive gymnast for 12 years, and has 14 years of cheerleading experience. Brandie is First Aid/CPR Certified and USASF Credentialed in Stunts/Pyramids/Tosses & Tumbling. This is her 8th year at Buffalo Envy, where her sense of humor and dedication to her athletes makes her a great staff member and coach. Brandie is a mother of 2 beautiful little future Envy Cheerleaders! She loves pushing kids to reach their personal best. Brandie is also a member of the Professional Firefighters of Buffalo. Coach Tina comes from a cheerleading family! Her mom was a coach for 15 years, and her sisters followed in her footsteps. Tina was a cheerleader since she was 6 years old. Tina has been a little league cheer coach for 20 years -she is the head coach for the South Buffalo Shamrocks, and also serves on the South Buffalo Football Association board of directors, and previously served as the organization’s co-coordinator. She has also coached the Bishop Timon High School cheerleading team for over 10 years. Tina is First Aid/CPR Certified and a certified coach through the National Alliance of Youth Sports. Coach Colleen is one of Buffalo Envy’s Co-Owners and coaches! She was an NCA Instructor for 6 years, 4 of them as head instructor. She also won Top Rookie Instructor in ’99. Colleen also cheered for Ohio State All Girl from ’98-’00. Colleen is one of the coaches that brought all star cheerleading to this area, and has truly enjoyed growing with the sport. She has coached teams to numerous titles, including the 2010 U.S. Finals Junior 3 Overall Championship team. Colleen is First Aid/CPR Certified, as well as USASF Certified Levels 1-5. She is also an NCA Certified Judge. Colleen does an amazing job coordinating Buffalo Envy’s Adaptive Program, and also coaches Senior 5, Youth 2, Senio 2, Tiny and Youth Prep. Colleen is a proud wife and mother of 3. Coach Julie, one of Buffalo Envy's co-owners, has been coaching all star cheerleading for over 10 years. Julie coached Buffalo Envy's Senior 5 team to the Cheerleading Worlds in 2009 & 2010, and will be coaching Senior 4.2 this season. Julie helped start one of the first all star programs in WNY. Julie is CPR/First Aid certified, and USASF certified levels 1-5. Julie is currently in nursing school to become an RN. Julie is the contact for fundraising at Buffalo Envy, and also has three daughters on 3 teams in the program - Haley, Claire, and Paige. Julie is an RN at ECMC. Kathy is Buffalo Envy's office manager. She keeps records of all athlete accounts and helps with many day-to-day happenings at the gym. You can usually find her in the office Monday-Wednesday, 5:30-9. Kathy has 6 grandchildren, and 3 of them are on Buffalo Envy teams!